Publisher’s Weekly reports that WonderCon still wants to return to the Bay Area, but that the limiting factor is scheduling. A convention needs additional days at the convention center to set up and tear down the event. So for a 3-day weekend event, they need to be in Wednesday or Thursday through Monday. They’ve been trying to avoid conflicting with other big comic conventions, specifically C2E2 in Chicago and Emerald City in Seattle. I remember one year they were the same weekend as MegaCon, but it was all the way on the East coast, so the two events were drawing from a different pool of guests and attendees. With Moscone basically the only convention center in the area that’s big enough, their options are limited. WonderCon’s last year (so far) in San Francisco was 2011. C2E2 launched in 2010, and grew to 41,000 attendees in 2012 and 50,000. Emerald City has been around for a decade, but expanded dramatically over the last few years, jumping from 13,000 attendees in 2009 to 32,000 in 2011. This year, all three cons* were in the 53-56K range. The other shows’ explosion in size coincides with WonderCon’s move out of San Francisco. Both shows were already growing before WonderCon moved to Anaheim, so while I’m sure some former regulars decided to go to Emerald City instead, I doubt it accounts for the bulk of the growth. It makes me wonder (no pun intended) whether WonderCon might be facing similar scheduling conflicts even if it had stayed in San Francisco back in 2012. If they do have to go up against another high-profile convention, it’s going to be one of those damned-if-you-do, damned-if-you-don’t situations. My feeling is they’d be better off scheduling for the same weekend as C2E2, since Chicago’s three times the distance and two time zones away. Sure, it could be seen as a proxy battle between the NYCC and SDCC juggernauts, but it would play better than looking like they’re stepping on the little guy. *I couldn’t find figures for ECCC 2013, but Wikipedia cites 53K in 2012, and they’ve been growing every year. C2E2 2013 was 53K, and WonderCon’s site cites 56K for 2013. This entry was posted in Conventions and tagged C2E2, Cross-Post, Emerald City Comicon, NaBloPoMo, NaBloPoMo 2013, See Also: Speed Force, WonderCon on November 27, 2013 by Kelson. Emerald City Comicon’s website was hacked and deleted this week…along with all their backups. Ticketing is all handled offsite by EventBrite, so tickets and financial info are safe. They’ve redirected their URL to the Facebook page while they rebuild their website. Lesson learned: Isolate your backups. I don’t just mean physically. Yes, you need to keep some offsite in case the reason you lost your server is that the building caught fire. But isolate the online access as well. If you back up your site by pushing the backups from your server to a remote location (either self-hosted or cloud storage like Dropbox or Amazon S3), those credentials are stored on your server somehow. What could an attacker do with them? Consider: If someone breaks into your web server, what else can they do in addition to vandalizing your site? Can they access other databases? Can they hop onto your internal network? Retrieve or alter private files? Can they get at your backups? If so, can they get at all your backups including private documents? The answers are going to depend on your network and backup setup. But they’re questions you need to start asking. 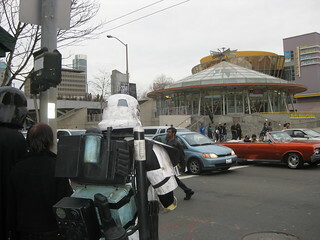 This entry was posted in Computer Security, Conventions and tagged backup, Emerald City Comicon on January 30, 2013 by Kelson.